When the Image is updated, the system will automatically create a restore point. By using the "restore to last" features, you can restore the Image to a previous restore point, you can fix mistakes, and multiple restores can be restored to its initial state. Using "merge to last", you can merge this operation from the last action, and you can also merge the multiple restore point. 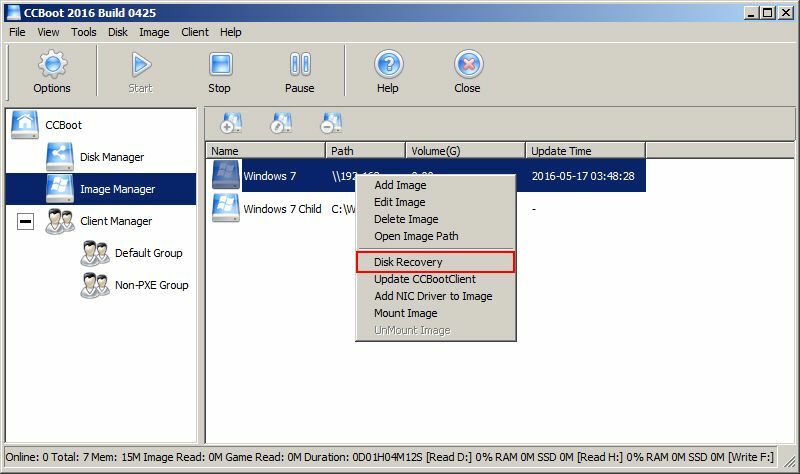 1) In CCBoot main interface,click "Disk Manager" in the details pane, right-click on the operation of the disk and then click "Disk Recovery" (Figure 1-1). 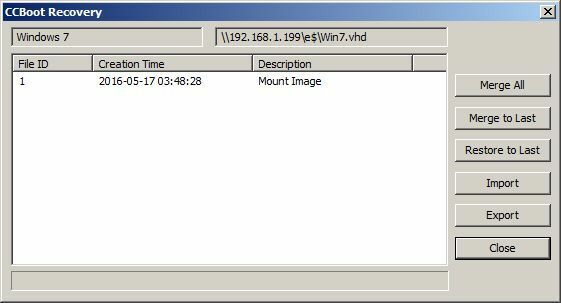 2) "CCBoot Recovery" dialog box will pop up, it lists all the recovery points created for the selected image (see Figure 1-2). Merge All: Merges all the restore points to the image making a single image. Merge to Last: Merge the current created restore point. For more details, please refer to "Merge Image". Restore to Last: Revert to the last restore point. Import: Import the restore point information from a backup file. Export: Export the restore point information to a file for backup.And import it when needed.